Seventy percent less energy than comparable accommodations, without sacrificing comfort! When we bought the house, our primary goal was to transform the deteriorated farmhouse into a sustainable and comfortable accommodation with minimal environmental impact. For this reason, we invest a lot of time and effort in the design and construction of several sustainable energy installations and the implementation of various “eco-practices”. 19.8 KW of photovoltaic panels, reducing our CO2 footprint with 20 tons of CO2 per year. all toilets have a double flush. In November 2014, TripAdvisor rewarded us, after an exhaustive audit carried out by Canadian and North American technicians, with the “Eco leader” distinction. A great aknowledge as sustainable accommodation. In the province of Tarragona only 5 hotels (!) are rewarded. In November 2016, Endesa granted us the A +++ energy efficiency classification. 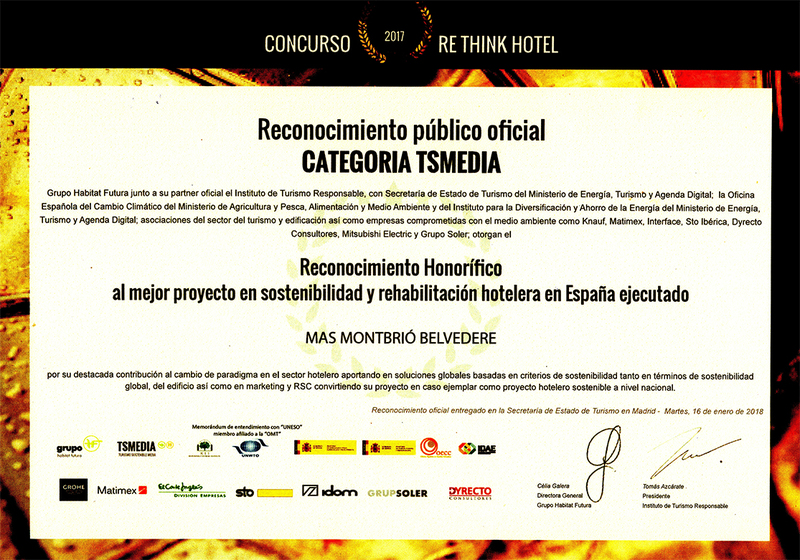 And in 2018 we received official recognition of being the best project in sustainability and hotel rehabilitation in all of Spain! We are proud to offer you a sustainable accommodation!